I made beef stew last night, and it was so good I knew I had to document it before I forgot what I did. This recipe was the basis for my efforts, but I made a few changes. I didn’t measure the spices, so the numbers below are just guesses, but it should give the general idea. Fry the beef in the olive oil until mostly browned on all sides. Add the garlic and saute another minute or so, then add the squash. Chop the squash and add to the pot as you go–the thin top third of the squash, I cut in half and sliced, the middle third, I cut into 4 sections and sliced, and the thickest bottom part, I cut into six sections and sliced, so I got thin slices around 1 inch by ½ inch or so. Sautee for 2 – 3 minutes to get the squash softened, then add the tomatoes, broth and spices and stir thoroughly. Bring to a boil, then reduce heat and simmer for 10-15 minutes to let the flavors blend, stirring occasionally. I really couldn’t believe how well this turned out–and I bet it will be even better today! I had planned to make cauli-rice to serve with it, but I didn’t feel like it at the time, so I just served the stew in bowls alone. 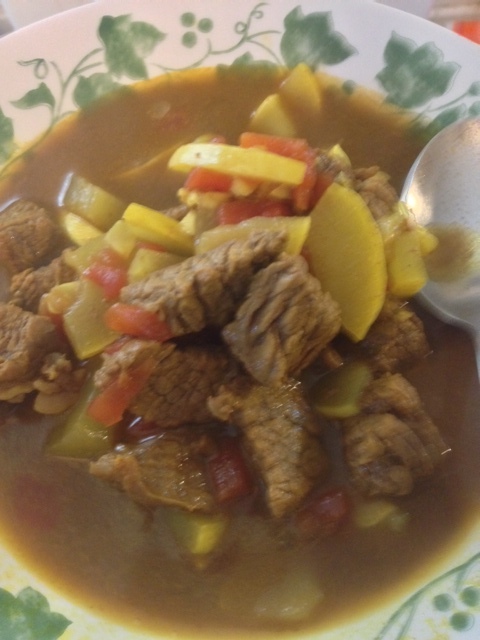 Everyone liked it, although my mother was over, and she thought it was a bit spicy. If she hadn’t been there, I might have put more spice in it, but I refrained because I know she doesn’t like things too hot. I have to admit: the low-carb stuff is seeming a bit boring to me. I am tired of eggs and bacon for breakfast. I am a little bored with salads for lunch. I miss the variety of high-carb foods out there. This week I am aiming to add more low-carb veggies to the mix to make things a bit more interesting. I am doing tuna salad stuffed tomatoes for lunch to have something different.Even though it is getting more summery here, I think I’ll add some soups to the mix, too. All I will need to buy this week is Italian sausage and maybe a bit of bacon and eggs and some green beans, so not a bad plan! Anyone else doing low-carb? What do you do for breakfast and lunch. It has been all bacon and eggs for breakfast and big salads for lunch here. That sounded so exciting, especially with full fat salad dressing, but I am bored, bored, bored. As always, there are a lot more menu-planning ideas over at orgjunkie.com! I really do love menu planning. I didn’t follow my plan exactly last week, but it still made things go so much more smoothly, and I was able to cook at home even on the night I had to drive way out in the county to get the boy a scouting thing for his pack meeting Wednesday night. I got back at about 6:15, and the meeting was at 7:00, but we still had a healthy home-cooked meal. Go me! 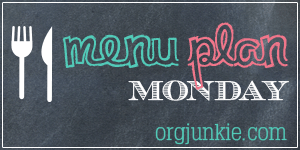 As always, this post will be linked to Menu Plan Monday at orgjunkie.com–lots more ideas over there! Last week, I didn’t make a menu plan, and I didn’t do much grocery shopping, but we still ate at home every night. Go me! We ate a lot of chicken–chicken tenderloins are so convenient, and easy to defrost even at the last minute–but I think we ate pretty well overall. So, not as much chicken as I was thinking. 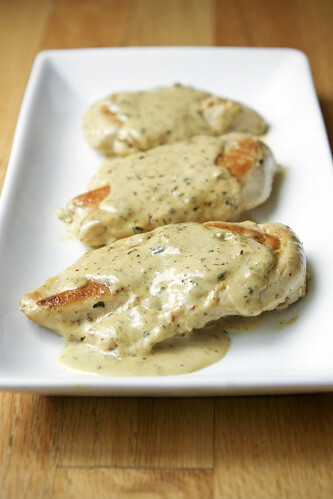 We are starting this week with two chicken dishes in a row, though, and the chicken in mustard cream sauce was Saturday night, so we are on a chicken run. I could rearrange things, but I want to make the inside out chicken cordon bleu tonight while my mother is over, so it can’t be helped.